The transmission is a crucial part of the health of your car. All too often, vehicle owners neglect their transmissions and forget the importance of basic transmission maintenance. To help keep your car or truck running great for years to come, we at Tran Star Transmission would like to share with you some information regarding your transmission. If you are looking for a Houston transmission shop, you’ve come to the right place. For over 25 years, Tran Star Transmission has been providing superb transmission services, including repairs, rebuilds, replacements, fluid changes, and much more. Contact us today to learn more or stop in for your free transmission diagnostic check. Does The Transmission Fluid Need To Be Changed? Yes. However, how often this is needed will vary depending on the type of vehicle you have. For example, many new vehicles can go up to 100,000 miles before the transmission fluid needs to be changed. Consult your car’s manual and the manufacturer’s recommended service intervals. On the other hand, servicing your car regularly and ahead of schedule can never hurt. After all, getting the fluid changed will certainly cost you way less than a transmission replacement. It can also be helpful to check whether your car has been subject to any recalls that may affect the transmission. To check on the recall status of your car, Consumer Reports Car Recall Tracker is an excellent source. Should A Mechanic Flush The Transmission Fluid? Before we answer this question, it is important to first consider the role transmission fluid plays in a vehicle’s operation. Essentially, the fluid keeps the mechanical components lubricated and cool. Over time, this fluid becomes contaminated with dirt and other tiny particles, which prevents it from excelling at its function. While this won’t be a frequent occurrence for new vehicles, taking your car into a transmission mechanic and letting them have a look can ensure that everything is in working order, giving you peace of mind. For example, if your mechanic discovers that metal shavings are polluting the fluid over a short period of time, this could indicate the presence of a much bigger problem, which can then be caught early, rather than later, saving you time, money, and a massive headache. Does A Manual Transmission Need Fluid? Although the type of fluid needed can vary from transmission to transmission, both manuals and automatics need transmission fluid. Either way, it is crucial to make sure that you are putting in the appropriate type of fluid. Failing to do so can severely jeopardize the performance of your car and the longevity of your transmission. 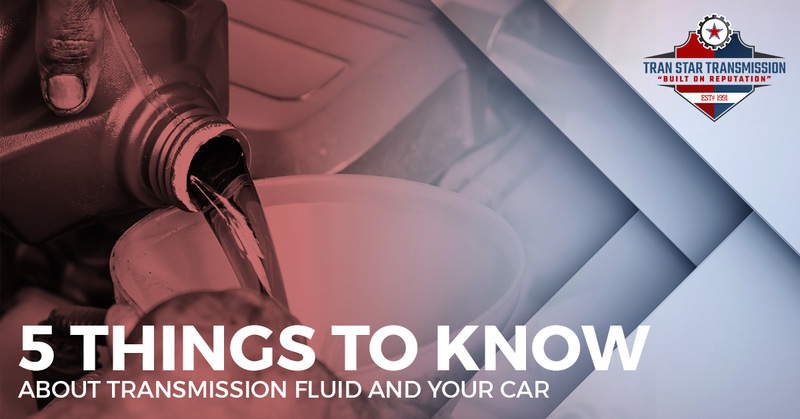 On this topic, it is also important to note that automatic CVTs often need CVT-specific fluid, so always be sure to refer to your owner’s manual when determining the type of fluid that goes into your vehicle. How Do You Know When The Fluid Needs Changed? Unlike the oil, checking your transmission fluid isn’t always easy. Although some cars and trucks have a transmission dipstick or reservoir that easily allows owners to monitor levels, this isn’t always the case for all vehicles. Oftentimes, you need a lift to examine the quality and fluid level. For this reason, it is good practice to ask your mechanic to check the transmission fluid when he or she is doing routine maintenance. The benefit of having an experienced transmission shop do this is that they can make you aware of potential problems that may not have seemed like problems to you. For example, while fluid levels may look fine and dandy, the fluid could be riddled with pollutants and small metal particles that can threaten the performance of your transmission. Is It Easy To Change The Transmission Fluid? Yes and no. Basically, it all boils down to how familiar you are with cars and transmissions. For the average car owner, this can be a complicated and messy task. A big part of this trouble relates to access. Being able to comfortably reach the transmission requires ramps, jack stands, or a lift, and getting to the fill plug can be quite challenging and often harder than an oil change. Another potential obstacle to consider for DIYers is that many new vehicles have transmissions that are sealed tightly and require a dealer’s service computer to fully access. If you are in need of a transmission fluid change, stop by our Houston transmission shop today. We are a full-service transmission shop, and we take great pride in helping to keep people safe and their cars running great. Also, if it’s been a while since your transmission has been serviced and inspected, or you are starting to notice your transmission slipping, come in for a free diagnostic check. Contact us today to learn more or to schedule your appointment.